under moist debris, rotting wood, etc. With a name meaning "thousand legs," you know it's got to be interesting to look at! There are more than 7,000 species of millipedes in various habitats throughout the world. Despite their name, millipedes may have a hundred legs, but not a thousand. The African giant millipede is an arthropod. Arthropods comprise the largest phylum in the animal kingdom. A segmented body, segmented appendages, and an exoskeleton roughly distinguish them from other animals. Arthropods include crustaceans, insects, spiders, and their relatives, centipedes, and millipedes--and encompass more than a million species. The African giant millipede is a long, black, cylindrical animal, with four legs (two pairs) on each body segment. It is thought to be the largest millipede in the world, growing to 12 inches long. It lives in the rain forests of Africa, where the weather is warm and humid and the forest floor is thick with dead vegetation. They love it when their food falls on the floor...the forest floor that is. It is a herbivore, which means it feeds mainly on plants. Powerful legs help the millipede navigate through the mountain of tasty dead vegetation that has fallen into their path. While rain forests are covered in lush vegetation, the quality of the soil is usually very poor. Thirsty plants quickly absorb heavy rains and the water is carried up the trunks into the treetops. The quick recycling of nutrients and water among the atmosphere, the soil, and the plants deplete nutrients in the soil. Animals called decomposers keep the cycle moving. Decomposers, like bacteria, fungi, some insects, and millipedes, eat decaying animal and plant matter and turn it into inorganic matter. When the inorganic matter is excreted, it contains the nutrients necessary to keep the cycle moving. 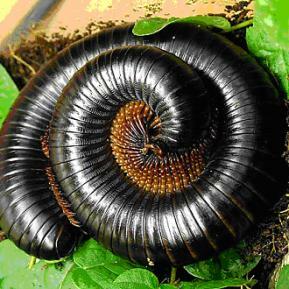 African giant millipedes usually live alone. The females lay hundreds of eggs in a nest they make of compressed soil just below the surface. The eggs have a tough coating to protect them. Upon hatching, the millipedes usually have seven or eight pairs of legs. They add legs with each molting until they reach their adult size, when they usually have about 100 legs. With a highly segmented body, African giant millipedes often curl up into a ball if threatened, and can secrete a foul-smelling liquid. The liquid is not dangerous to people unless they get it in their eyes or they eat the millipede. You can see African giant millipedes in Habitat Africa! The Forest. A millipede is as useful as it is pretty, helping recycle decaying organic matter on the forest floor.